Hi! We are Daryll and Elaine Smith of Holiday Hills Christmas Trees. 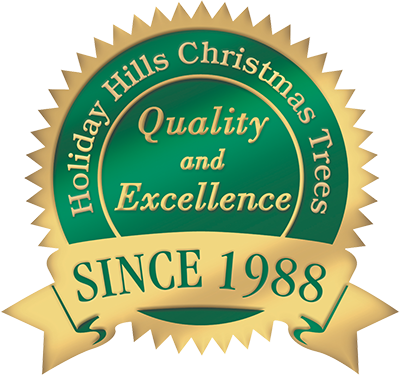 We have been growing our beautiful premium Oregon Christmas trees in the Willamette Valley and selling them here in the greater San Antonio, Texas area since 1988. San Antonio is a beautiful, vibrant city with so much to see and do, so if you come down to help us this year, allow plenty of time before and after the season to enjoy the area. San Antonio is well known for its River Walk for good reason – the Christmas light display is spectacular – it’s like a fairy-wonderland, with boat rides, music, shops, and food – so much food! And you usually don’t need to bundle up against the cold. These positions are for two people, and both of you need to be healthy, active adults, and at least one of you needs to be strong enough physically to wrestle heavy trees occasionally or assist with loading trees onto car tops or into the back of pickups or car trunks. Each year we operate approximately 15 retail sales locations, each staffed with two Lot Operators who “live” on location in their own RV. Contracts run from the 1st or 2nd weeks in November through clean-up, which can be shortly before Christmas if we sell out early (which is always our goal), or shortly after Christmas. Orientation and training will be conducted for each new Operator, and a second, follow-up training meeting for everyone – new and returning – on the next weekend, dates to be announced. There will be demonstrations, instruction in “how-tos” of equipment and office procedures. It’s an all-day meeting, we swap ideas, and take a lunch break mid-day. You’ll be provided with everything you need to have a successful and profitable season. Lot assembly begins soon after, then trees start arriving, and our first official day of sales is the day after Thanksgiving. We pay a base salary with commissions, bonuses, and incentives. Payment is made at the end of the season with a 1099 furnished for tax purposes. We furnish all hookups (you only provide whatever propane you use). Electrical hookups are 200 amp panels with 50-amp RV service. All lots are completely fenced for your security, fully lit with perimeter lighting, and are located in only the safest neighborhoods, close to shopping and most services. Lot Operators participate in setting up their own lot, so you both need to be physically active and healthy. Setting-up consists of assembling a “pre-fab” sales booth, laying out PVC pipes and/or hoses with faucets, mounting fire extinguishers, installing light strings inside the tent and spot-lighting on the perimeter fencing. You get lots of help from us on all these tasks. Garbage receptacles are furnished at each location as well as porta-potties for use by your customers and lot help. Open hours are from 11 a.m. to 9 p.m. each day except Saturday, which is from 9 a.m. to 9 p.m., because that is our busiest day. There are no days off for approximately 45 days, but the time flies by with happy customers and families who are generally in a festive holiday mood. We actually are serving 3rd generation customers now who have developed a fierce loyalty to us – we like to think it’s not just because of our high-quality, guaranteed trees, but the outstanding customer service we provide, which is our #1 concern. We also have several operators and employees who have been with us upwards of 10 years – some for 20 years – and we all have come to think of each other as family as well as friends. On Christmas day, we treat the Lot Operators to dinner combined with a business meeting to recap the season, share experiences, make suggestions and relax before finishing loose ends. After dinner is when many of us go to the River Walk. (5) and describe your knowledge/experience in each of the areas covered in the description of the job above – basic electrical, plumbing, carpentry, supervision of laborers, salesmanship, customer service, basic office etiquette, business machines (cash registers and debit/credit machines), routine office forms such as sales recaps and inventory. E-mail to HHCTrees@gmail.com, or snail-mail to 7807 Fortune Dr, San Antonio TX 78250-5105. You can also reach as our San Antonio office phone 210-520-8890 (Central time zone). As soon as you see the tent going up, you know lots of work is following right behind. There’s a good amount of physical work involved, so you’ll need to be healthy and active, at least 18 years old, and strong enough physically to wrestle heavy trees occasionally or assist with loading trees onto car tops or into the back of pickups or car trunks. Our tents usually go up the second week in November, and that’s when the work starts. You’ll need your own means of transportation, and proper clothing – work gloves, work shoes/boots, sturdy pants/jeans. There’s a lot of filling water bowls with water as well as walking through damp trees to show customers a particular tree they may have picked out. So your shoes and jeans may get wet. Having an extra pair on hand might be nice. We furnish baseball-style hats for you to wear while you’re on the job to identify you as an employee to the customers. T-shirts are fine, but no clothing with gang colors or “suggestive” or obscene pictures or sayings are allowed. Wages depend on your experience, and will be agreed on between you and the Lot Operator who hires you. The office provides guidelines, so there won’t be a difference between locations. Some typical duties might be assisting in the assembling of a “pre-fab” sales booth, laying out PVC pipes and/or hoses with faucets, mounting fire extinguishers, installing light strings inside the tent and spot-lighting on the perimeter fencing. Then after trees start arriving, the trees are unloaded from their trailers, they are counted, stacked by species and size, a fresh cut is made with a chain saw, use an electric drill in the trunk bottom to fit our stands, stand the trees in the proper sized stand, move the tree to the floor in the designated area, fill the stand with water, remove the baling twine, and “fluff” out the branches. You’ll help the Operators with keeping all debris picked up, keeping the floor free from all obstructions and debris, assist with questions from customers, sell the products, take the customers and their choices to the cashier, and help load the trees into the cars. To apply, watch for tents going up, usually the first or second week in November. You may apply directly with the Lot Operators, or feel free to call our office in San Antonio for information on openings in your area – 210-520-8890. Have picture I.D. and your Social Security card with you when you apply.